Circles, porcelain with acrylic paint, 8 1/2 x 9 3/8 x 3/4 in. There's still so much about clay that I have to learn, but I'm beginning to get an idea of where I'm going with it and how to use the material, with which I'm still in passionate love. Things I've learned: making the piece in two separate panels and joining them after firing looks better and works better in terms of keeping slabs flat-ish; acrylic paint is the perfect paint for fired clay, handling beautifully; working on a damp plaster bat keeps the clay from drying out as I work with it; I'm figuring out how to dry the clay slabs slowly so they won't warp; sanding the bone dry sculpture and framing slab helps in refining the form and smoothing it, using 320 then 600 sandpaper. That's some of the technical stuff, and there's a lot of that for a neophyte such as myself to figure out. But then there's the big question of form and of content: what to depict? The first piece I did that I felt good about, which you can see here, was a detail of an Egyptian relief; I learned a great deal about making three dimensional form by doing it. 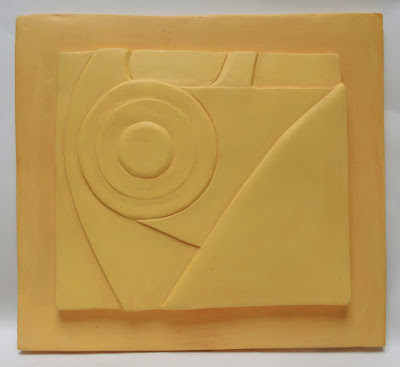 I now have pages and pages of thumbnail sketches and drawings for possible relief sculpture. What I'm doing right now is alternating imagery that comes from the same sources as my paintings––agricultural machinery, seen abstractly––with purely abstract forms. Circles is based on a machine, and Swerve, below, is just me playing about with form. I will pursue both and see where they take me. 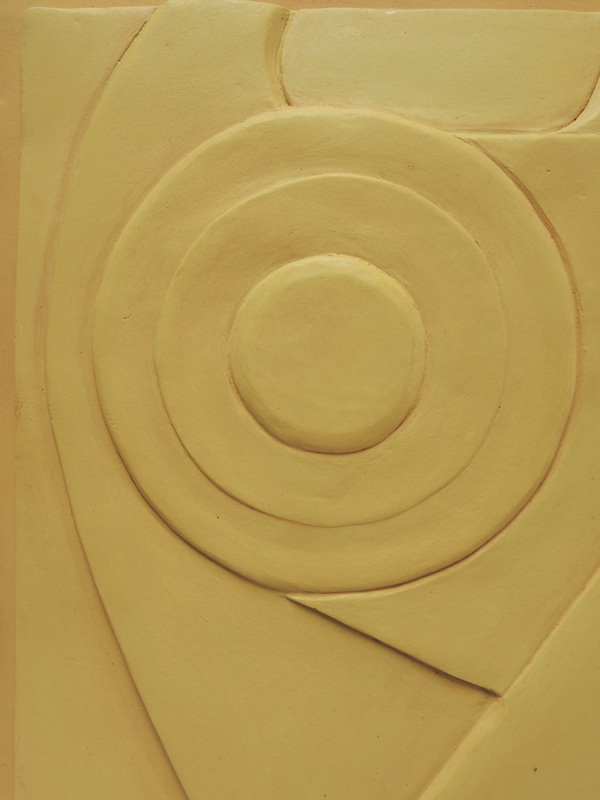 I want to make works that are interesting to look at, even compelling, but for me the main reason I want to do this clay work is the deep pleasure I get from creating form, from making different kinds of lines, from adding and subtracting clay as forms recede and advance. 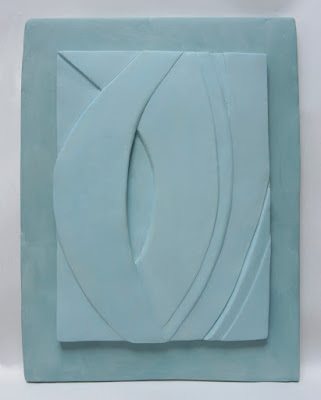 I do this in painting, illusionistically; low relief sculpture is as close to painting as sculpture can be: there is real physical form, but it's so minimal as to allude to illusionism. I find that fascinating. Swerve, porcelain with acrylic paint, 11 1/4 x 9 3/8 x 3/4 in. I wanted to do a piece with curves, which have a very different feeling from the geometry that tends to come with machine images. When I begin to work on a slab, I incise the design traced from a drawing onto the clay, then begin to carve it. I don't have a clear plan of action beforehand; I don't know what kind of edges I'll use or how I'll sculpt the form. It's a process of figuring it out as I go along, though the figuring is getting easier as I become more accustomed to the process. Color is something I work on after the piece is fired, and it's a bit arbitrary: oh, I'll try yellow for this, blue for that. So far I've been thinking that lighter colors show the form better, but I may in future push into darker hues. Some edges are rounded, and others are more crisp; some deeper and some shallow. 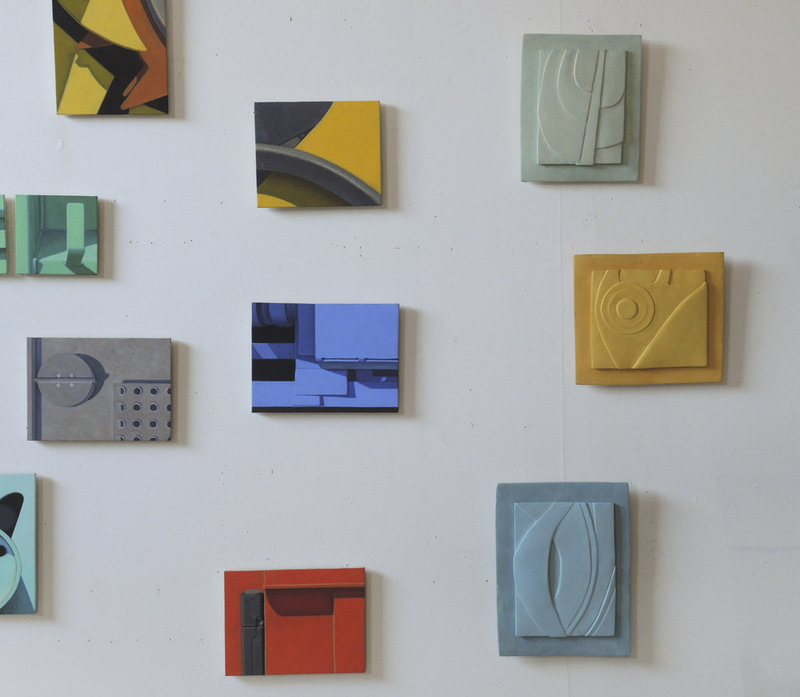 I hung three clay reliefs in my studio alongside paintings to see how they conversed with each other. The drama of color in the paintings seems to be balanced by the three dimensional form of the sculpture. 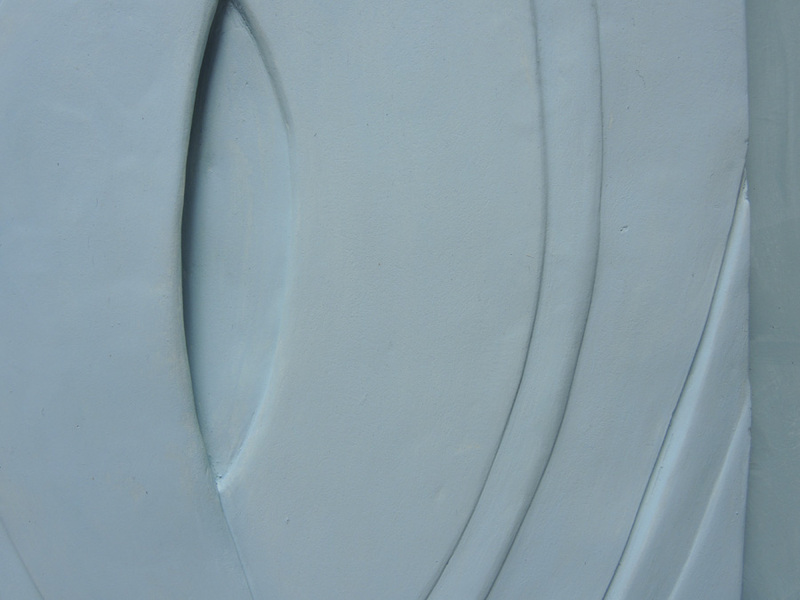 It's funny: as I'm working on the sculpture I feel as though I'm channeling some early 20th century modernism, like American work from the 1930s, the machine age. "Cutting edge" is not something I'll ever be. ha, It doesn't matter what edges are cut your work is excellent. I really like swerve. My favorite is the one hung above the yellow one. Of course I think of it as a plant stem going up through leaves...looking close at the plant. Nice. Thanks so much, Lisa and Sue. Dream: Margrethe Dybdahl shares her matt-glaze-secrets with you. I tile my shower with these. I do not wake up...just shower, enjoying the water flowing across these fantastic tiles, shadows cast from the sunlight entering through the glass-block wall. The Dybdahl mastery of matt glaze...my hat's off to it, as to your delightful masteries! They converse well, Altoon...an exciting direction in your work.